Replacing the windows in your home is an investment. That’s why it’s important to explore window styles and options before making your decision. Stanek® custom-shaped windows can create a focal point in your room while also adding curb appeal to your home. What is a Custom-Shaped Window? Also known as picture windows or fixed windows, custom-shaped windows typically do not open and are used to maximize views and the amount of light that comes into your home. 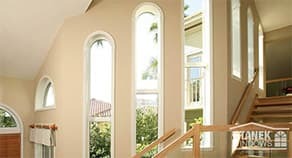 Custom-shaped windows can come in a variety of geometric shapes and sizes to match the style and aesthetics of your home. Ideal for areas in your home that are hard to reach and don’t need ventilation, such as a staircase, cathedral ceiling or above existing doors and windows. Custom-shaped vinyl windows are a perfect way to set your home apart by adding character and accenting the style of your home. Custom-shaped windows also allow you to let more natural light into your home and extend your views of the outdoors. 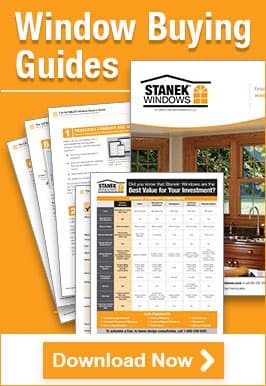 At Stanek Windows, we understand that your home is unique; that’s why we offer a variety of sizes and configurations to match your one-of-a-kind space. Geometric shapes. Choose from 25 shapes for maximum personalization. Custom designer glass. Customize your windows with privacy glass or add character with decorative etched glass patterns. Energy-efficient glass. Choose between double- or triple-pane glass for ultimate protection from the elements. Decorative grids. Between-the-glass window grids give you the ability to add a distinctive character to a room with multiple patterns and shapes available. Interior and exterior colors. Choose from a variety of color options to match the design aesthetic of your home with our durable interior and exterior color selections. Custom window sizes. From cathedral to circle top, Stanek offers a wide variety of configurations and sizing options. Why Choose Stanek Custom Shape Windows? Stanek offers 25 specialty window shapes and endless ways to personalize and match your home with unlimited exterior color options. Our standard 7/8-inch glass packages will maximize your heating and cooling returns, making your windows not only beautiful, but also energy efficient. All Stanek windows include a limited lifetime warranty on material and a two-year warranty on labor. It’s important to us that you purchase the quality windows you need at a price you can afford. That’s why we offer financing options to ensure that you receive the perfect windows within your budget. If you’re interested in learning more about our custom shape windows and styles and configurations, view our windows catalog. If you’re ready to start designing your custom shape windows, schedule your free, in-home estimate today or give us a call at 1-800-230-8301.